It is time to renew your GATE card! We’d like to remind customers to renew their Georgia GATE card for sales and use tax exemption in 2018. 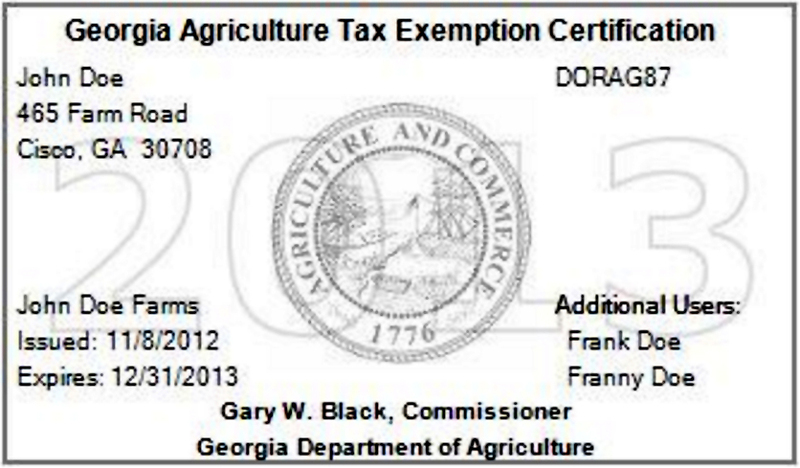 The Georgia Agriculture Tax Exemption program (GATE) is an agricultural sales and use tax exemption certificate issued by the Department of Agriculture that identifies its user as a qualified farmer or agricultural producer. The Georgia Agriculture Tax Exemption (GATE) is a program created through legislation, which offers qualified agriculture producers a sales tax exemption on agricultural equipment and production inputs. The program replaced the Agricultural Certification of Exemption (ST-A1) form. Registration is available today. You will be charged a $20 fee for all online applications and a $25 fee for applications requiring assistance (i.e. mail and call center). More information can be found here You may email you questions or comments directly to farmtax@agr.georgia.gov. To contact the call center between the hours of 8 am and 5:00 pm M-F, dial 1-(855)-FARM TAX, or 1-(855) 327-6829. North Fulton Feed & Seed requires a copy of your GATE card to be on file at the store for sales tax exemption. This entry was posted on Wednesday, December 27th, 2017 at 6:15 pm	and is filed under News Item. You can follow any responses to this entry through the RSS 2.0 feed. Both comments and pings are currently closed.